My John Dee character appears in another flash fiction story, this one set in1586. You can find the story at Flashes in the Dark. Notes: I'm a little familiar with this author's work from about 25 to 30 years ago. Then he was mostly known as a horror writer, specifically his historical vampire tales, of which The Keep is the best known. But since then he has become known for his Repairman Jack series of novels, of which this novel I'm reading is one. I've been meaning to get to a Repairman Jack story for some time now, so here goes. Mini review: Probably the most exciting and fun book I've read this year. 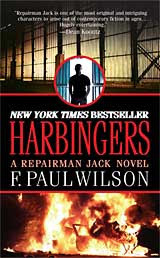 Wilson's Repairman Jack character is one of the most fun, yet toughest hard cases I've read of in a while. And the back story and the background, it's fantastic, and owes at least a little to Lovecraft. Very interesting, and fantastic writing. I'll be seeking out more in this series. Below are links to three of my short stories published at the Triond authors' site. None of these stories have been published elsewhere. This was the very first short story I ever wrote. It came together about 20 years ago when a professor told me I could write a short story instead of a paper for my astronomy class. It was not, however, the first fiction I'd written. I've still got two novels I wrote, one in fourth grade and the other in sixth grade. Plus I made a whole bunch of my own comic books, but I'm sorry to say I no longer have any of those. I have to admit this story is pretty rough, but it was my first attempt at a short story. This is a short piece of flash fiction I had been trying to sell to various markets for several years now. No one bit, so I decided to go ahead and release it on Triond. This story is about the events of 9/11, and editors always gave me two reasons for not wanting story, basically "too soon" or "we've been bombarded with 9/11 stories." This story was written more than a dozen years ago. It was my reaction to a Counting Crows album that came out at the time, "This Desert Life," which contained the song "St. Robinson in His Cadillac Dream." Admittedly, most of these articles are pretty basic, but I'm not writing for the die-hard writer but more for the non-professional who is considering writing interests. Notes: The last book I read was pretty intense, so I thought it was time for another quick, fun read. As often happens, I turn to Ed McBain. This is another 87th Precinct novel to feature the serial villain, the Deaf Man. 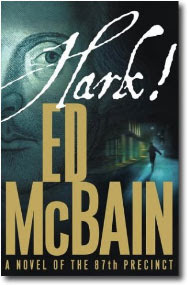 Published in 2004, making it one of the last of McBain's works. Mini review: Another fine read! Too bad it's the last Deaf Man novel, and nearly the last work of fiction for the 87th Precinct since McBain passed away the year after this novel was published. But McBain wrote plenty, and had much to be proud of. A toast to him! ... but there's a new widgey on the bottom left of this page. That widget lists my non-fiction articles, and the occassional fiction story (stuff I couldn't sell after 50 or so tries) from my account over at Triond.com, a place where you can basically publish anything (or just about anything) and make a little money off it from advertising. Yes, I'm selling out. What the heck. I'm unemployed and need what little money I can get. Since I was recently asked by someone, let me set the record straight here and now: No, I am not giving up on speculative fiction. I am not stopping reading and writing speculative fiction. Yes, I've been staying away from fantasy reading most of this year. I've snuck in a few horror books here and there, and just a touch of science fiction though mostly more literary sci-fi. All of this has been intentional for three reasons. One, I needed a break from fantasy. I read a fair amount of fantasy last year, and I felt like a change of pace. I don't want to become stale in my reading or writing. I went through a period of about 10 years where I didn't read any fantasy at all because I'd become bored with everything I had read and wasn't finding anything new worth persuing. I don't want that to happen again. Two, frankly I've just been in the mood to catch up on some literary and classic novels I've been meaning to get to for ages. These are just books I've wanted to read or felt like I should read, so I'm getting to some of them this year. Also, I think it behooves a writer of any type to branch out in their reading; it can help the writer discover new ways of telling stories, and give plot and character ideas out of the norm. As example, I should've read "The Scarlet Pimpernel" years ago. Three, I've been working on a more literary novel this year. So, to some extent I've tried to stay away from speculative fiction so I wouldn't feel the need or want to write some. Notes: Despite the fact I despise her politics and find her philosophy lacking in so many ways, Ayn Rand is one of my favorite authors. It's just too bad she didn't leave behind more novels and stories. This is one of her earliest novels, originally published in 1936. It's semi-autobiographical, pertaining to a young woman's survival in (and I'm guessing eventual escape from) early Soviet Russia. Mini review: As always, Ayn Rand writes an excellent novel. This being her first novel, it's not quite as intense as her later, stronger books that are more philosophical. Still, there's an excellent story here about the struggles and trials of people trying to survive in the early days of the U.S.S.R. As can be expected to some extent, the story is not an overly happy one. And the reader can see how Rand is still working out the themes to her personal philosophy of objectivism. This novel is semi-autobiographical, as Rand herself admits, though most of the characters and events are made up, as are all the characters' names. The following advice is not from your's truly, but is a list compiled by publisher, editor, graphic designer and writer crystalwizard of Abandoned Towers Magazine. So, very little of what you read below comes from me (though I did add a suggestion or two which crystalwizard has incorporated). If you have more ideas for writers wanting to market their work, check out this thread at the SFReader.com forums and feel free to add your suggestions. Another thing to keep in mind, all of these ideas are for free ways to market writing. Enjoy! There are many ways to market that don't cost you anything but time and effort. 1. Are you on Twitter? Get there and start tweeting little bits of tantalizing information about the book.Invite everyone you know to follow you on twitter, put up a follow me link to your twitter profile on your webpage or blog. 2. Do you have a blog? You'd better and you'd better update it frequently. 3. Do you have a website? If not, Weebly has great,websites for free. Go here: http://www.weebly.com set one up and update it on a regular basis. Focus on the book at least for a while. 4. Do you have short stories and articles out there published by different e-zines? Get to work and make that happen. 5. Do you have a facebook and myspace page, and a lot of people in your friends list? Get those and populate the friends lists with everyone you can that are already on those sites. Search the membership for various keywords that match your book and then invite everyone that shows up in the searches. 6. Have you contacted blogtalk radio and gotten interviews set up? Do so. 7. Have you gone through all the various internet radio stations, found the ones that are appropriate to your book and contacted them for interviews? Do so. 8. Have you contacted your local media and set up interviews? You need to. 9. Have you contacted every bookstore you can think of in your local area (within an hour or 2 driving distance) and set up signings? Do that immediately. 10. Have you contacted orginzations such as the rotary club, lion's clubs, school groups and so on that are appropriate for your book and arranged to give talks (with the agreement you can sell copies of your book after the talk)? Do that as well. 11. Youtube. Good book trailers that are professionally produced, or at least look professionally produced, are extremely important to put up on youtube. 12. Contact webzines that fit the book and see if they would be willing to run an interview or an excerpt from the book in exchange for some advertising on your website or blog. 13. Exchange banners with websites that match what the book's about. 14. For authors with American publishers who are living overseas, the US embassy is a great place to make contacts. They generally work truly hard to promote local authors (the cultural side of the embassies is very active). 15. There are usually associatons in every community which promote the cultural side of life. Contact them and set up events. 16. Contact your local library.to set up a talk and/or reading. You can't usually sell your book there, but people who come will appreciate that you came and will often go out and buy the book.And make sure your library has a copy. Give them a free copy of the book. Don't underestimate the power of libraries. Librarians talk to each other and will tell other librarians about your book, which will encourage other libraries to buy the book, which generates a lot of sales. There are THOUSANDS of libraries in California alone. That's a lot of potential sales. 17. Contact local colleges and universities.Most colleges of any size will have tons of differnt groups and/or classes that would be interested in having a writer visit or speak. 18. Contact various student groups, from beginning writers to speaking organizations to the local role-playing gamers' group, that might be interested. 19. Speak with creative writing professors at local colleges and universities, as well as adult education programs, about visiting their class and discussing your experiences. 20. If you're an alumni, contact your various alumni organizations; see about speaking at a conference and before to mention you have a new book.or story about to be published. Request to have it listed in their alumni literature or on the websites. 1. Seek out chain bookstores that specialize in English-language literature. For example, Argentina has a chain called KEL, which is English Only and has five or six outlets. Provide contact information to your publisher if they won't speak to the author. 2. School libraries are deinitely a great place to sell books as long as the book is clean and wholesome enough that no one will ever objecct to their presence. Think of the image you're trying to create about the book and the author. That will help guide your media efforts, especially with your website and blog. Everything you do should tie together.There are hundreds more things you can do. How many of the above have you already done? Yes, at last, after two months, the first draft of my latest novel is finished. Now it's off to bed. Then there's editing and rewriting and querying agents, etc., etc. Just wanted to note it here. I'd yak more about the book, but I'm tired.